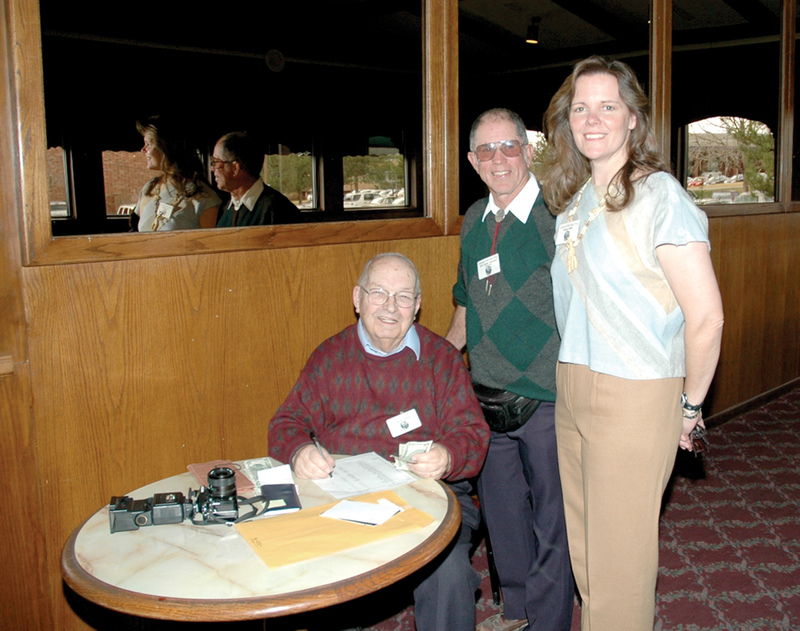 L to R: Colorado Mile High Wing Treasurer Chuck Holmes, Secretary Donna Miller and President Robert Taylor, who is also the national president of the OX-5 Aviation Pioneers. 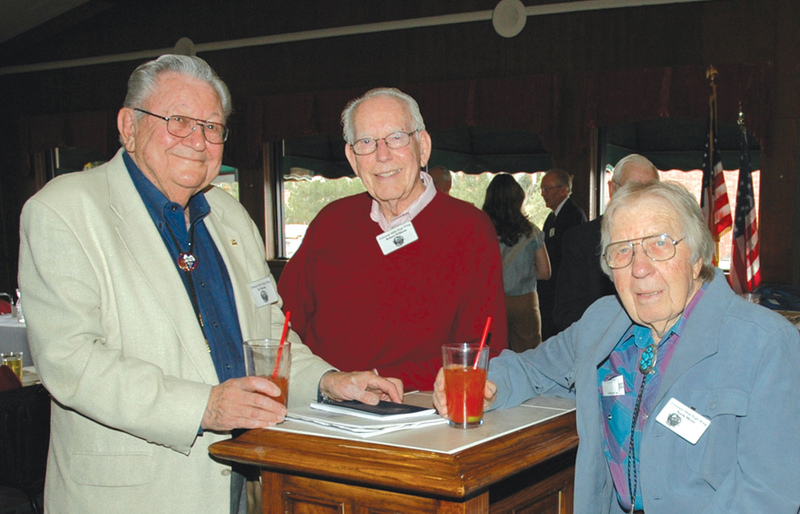 The Colorado Mile High Wing of the OX-5 Aviation Pioneers met at Colorado’s only remaining Marie Calendar’s on March 20, for a reception, a great lunch, and to hear a guest speaker talk about a subject they all hold dear: pioneer aviation. With the help of an overhead projector and an abundance of vintage slides, Allan Lockheed Jr. gave the history of two well-known aviation pioneers, his father, Allan Lockheed, and his uncle, Malcolm, as well as that of the company they founded. Although the organization’s motto is “Aviation History by those Who Lived It,” that’s getting a little harder these days. The OX-5 Aviation Pioneers began as an association of aviators who helped mold the development of early aviation. All “pioneer” members must have flown or worked on aircraft powered by the OX-5 engine. In the early 1990s, the OX-5 Aviation Pioneers recognized the need to carry on the traditions of the organization after all of the true pioneers have folded their wings. The idea of “historian” members was created to allow those who are carrying on the traditions of aviation to enter the organization to continue its good works and to ensure that the brave pioneers of the past aren’t forgotten. The organization gets their name from the OX-5 engine, which was built by Curtiss as a variant of the model OX engine that was first produced in 1913. OX engines were produced and installed in both civil and military aircraft from 1913 to 1918. The engine powered the venerable JN-4 “Jenny” as well as a number of aircraft that saw action in WWI. Producing 90 horsepower at 1,400 rpm, a total of 12,619 were produced. 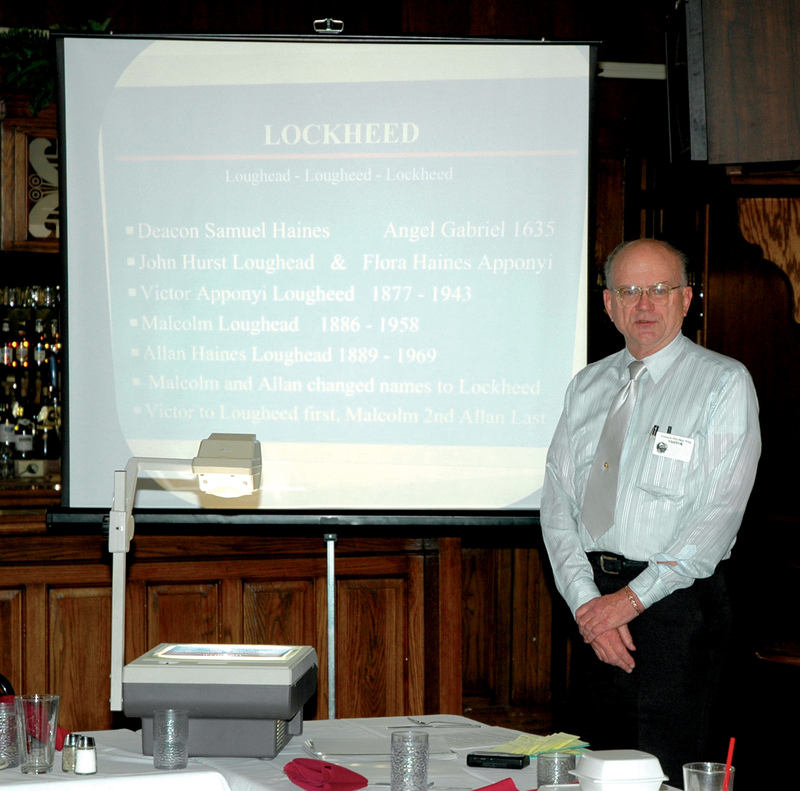 Allan Lockheed Jr. presented a talk on aviation pioneers Allan and Malcolm Lockheed. In June 1955, Charles B. Carroll, then operator of Latrobe Airport (Penn.) appeared before the Aero Club of Pittsburgh. He approached Clifford Ball, then manager of Greater Pittsburgh Airport and president of the Aero Club, and suggested they arrange a rally for OX-5 pilots. The purpose of the meeting was to round up old-time Pennsylvania aviation people and to honor them for the part they played in laying the foundation of the aviation industry, as we know it today. Ball agreed to spearhead the project, which was not expected to be of more than local interest. Carroll welcomed the opportunity to host the aviation pioneers and a meeting was arranged at Latrobe Airport on Aug. 27, 1955. A luncheon, banquet and lodging were made available at the Mission Inn, and word of the rally began to spread. Realizing that there might be a need for a record of those who attended in case another get-together was desired, Ball prepared some temporary application forms. Temporary officers were selected until a formal election could be held. Russ Brinkley was appointed president, Ball was appointed secretary and Carroll was appointed treasurer. When the affair was over, 87 persons had signed application forms and 20 more mailed them to the office, forming a 107-person nucleus of the OX-5 Club. At that time, the OX-5 Club of America came into existence and the parent club became the OX-5 Club of Pennsylvania. Word of the club spread and by the end of 1956, membership had climbed to 990. By the end of 1957, 3,259 more applications were received, bringing total membership to 4,249. Membership also spread to several other countries. By the end of 1985, the OX-5 Club had 12,800 members. Wing charters were issued with the District of Columbia receiving charter number one. On May 15, 1971, the OX-5 Aviation Pioneers Hall of Fame was inaugurated to honor those who have contributed significantly to the progress, growth or safety of aviation on a national scale. A longtime dream of Johnny Evans of Pennsylvania and one of the founding members, the Hall of Fame was made an important part of the OX-5 Aviation Pioneers by then National President Karl E. Voelter of Florida. L to R: Ed Mehlin (2004 OX-5 Aviation Pioneers Hall of Fame enshrinee), Bob Williams and Norm Meyer catch up at a pre-lunch reception. In addition to the Hall of Fame, the OX-5 Aviation Pioneers conduct an awards program that pays tribute to outstanding contributions of its members to the organization and to aviation. 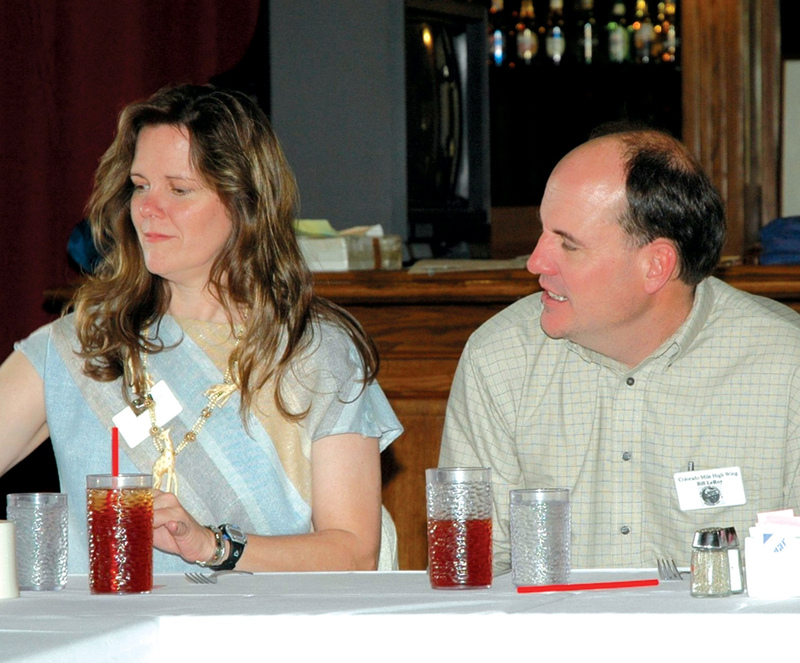 Each year one of the wings of the organization hosts a national reunion. The reunions attract much attention as many members from all parts of the country gather to renew old acquaintances and relive the golden days of yore. Lockheed Martin Corporation, formed in March 1995, traces its roots back to the early days of flight. In 1913, Allan and Malcolm Loughead (the name was later changed to Lockheed) flew the first Lockheed plane over San Francisco Bay. Lockheed Corporation was formed in 1932 after the fledgling airplane company was reorganized. In 1909, aviation pioneer Glenn L. Martin organized a company around a modest airplane construction business and built it into a major airframe supplier to U.S. military and commercial customers. Martin Marietta was established in 1961 when the Glenn L. Martin Company merged with American-Marietta Corp., a leading supplier of building and road construction materials. In 1996, Lockheed Martin completed its strategic combination with the defense electronics and systems integration businesses of Loral. The former Loral Corporation was founded in 1948 in New York City by William Lorenz and Leon Alpert as a small defense electronics firm that over the years grew into a multi-billion dollar firm. L to R: Donna Miller got a round of applause for recruiting a new member, Bill LeRoy, to the organization. For information about joining the OX-5 Aviation Pioneers, visit [http://www.ox5pioneers.org], or contact Robert W. Taylor, Colorado Mile High Wing president and national president, at 303-651-6692 or at ColoradoGold@msn.com.